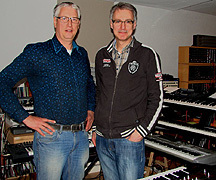 While the four tracks on Music for Cosmic Nights 2013 (67'19") produce some very heavy celestial energy Martin Peters and Rene de Bakker never break a sweat. 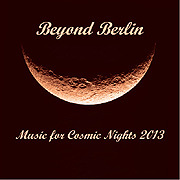 The coolest of collaborators, their project Beyond Berlin is not merely a retrograde display of 1970s cosmic music, but more the latest manifestation of an ever-evolving corner of the EM realm. Behind this creative force lies a command of the technology as well as a profound personal insight into the meaning and potential of the genre. The reserved atmosphere of this album is comprised of sounds that register with the listener before they are perceived. Illuminated by the strong, sharp light at the center of the galaxy these live studio sessions capture the strange magic at the heart of the Spacemusic experience. Sequencer lines - skipping, loping and cross-talking with soft keyboard leads, follow sweeping synth-string arrangements. The forward motion of music found in the symmetrical and regular recurrent grouping of tones propels each realization in repetitive mechanistic virtuosity. Beyond Berlin demonstrates an ability to generate emotion and drama from simple forms. Because there are no guitar leads to over-determine the melody Music for Cosmic Nights 2013 has an open feeling - a sense that any synth line can move out quickly to the deep spaces and back. This music takes us at once back yet looks forward - to an era where humanity strives to be connected by the divine spark that runs through the entirety of creation.